This prediction is very different than those we have seen for many months. We shall have to see if these two regions of below normal temperatures come to pass. This is a more "typical" temperature prediction from the Climate Prediction Center. Amazingly only the Pacific Northwest is expected to have below normal rainfall. The rest of the country is either above or equal chance for any possible outcome. 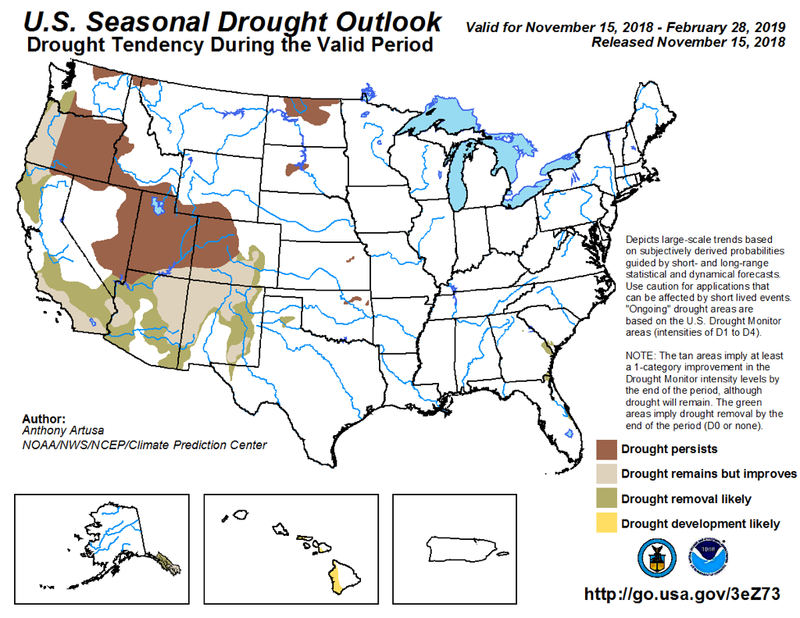 The increased rain in the Southwest deserts is consistent with El Niño. I don't know what is the basis for the rain continuing across the rest of the South into the Atlantic seaboard. This predication continues to trends of the previous months. 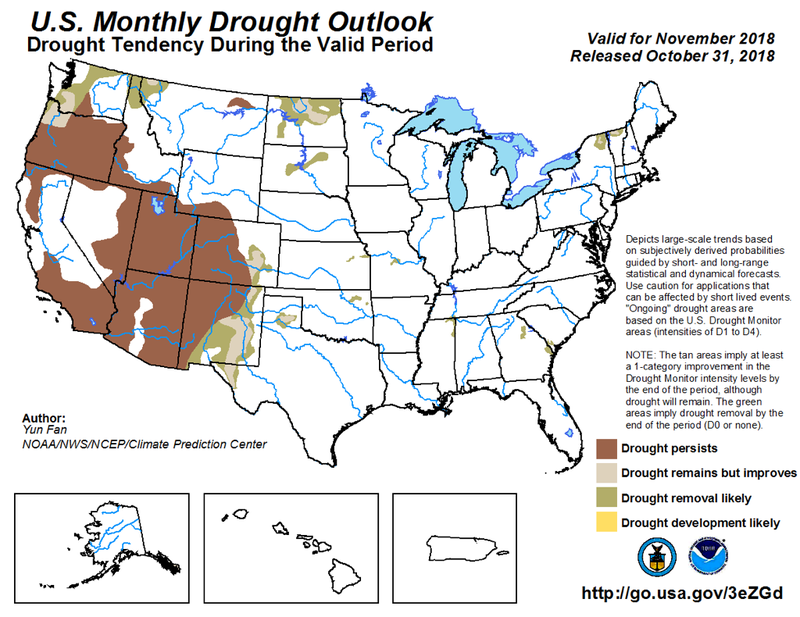 Once more there is an expectation of some drought relief in a narrow band of Arizona and Utah and nearby regions. 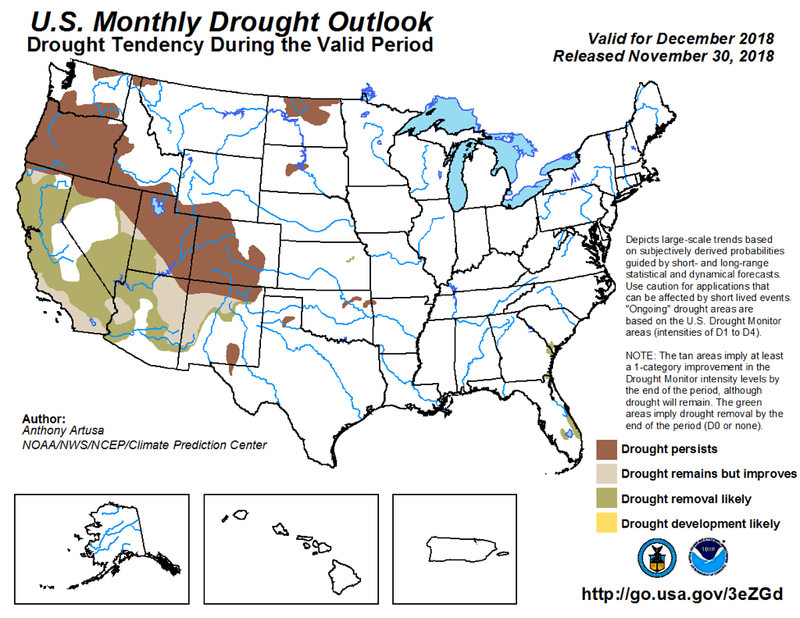 Oddly the relief for Arizona and Utah is expected to be wiped out by drought returning later this year. We are forecast to receive a lot of rain starting tomorrow, with flash flooding concerns in the recent burn scar areas of the mountains and canyons. They are forecasting rain for about a week from Hurricane Rosa, and then snow following all the rain. 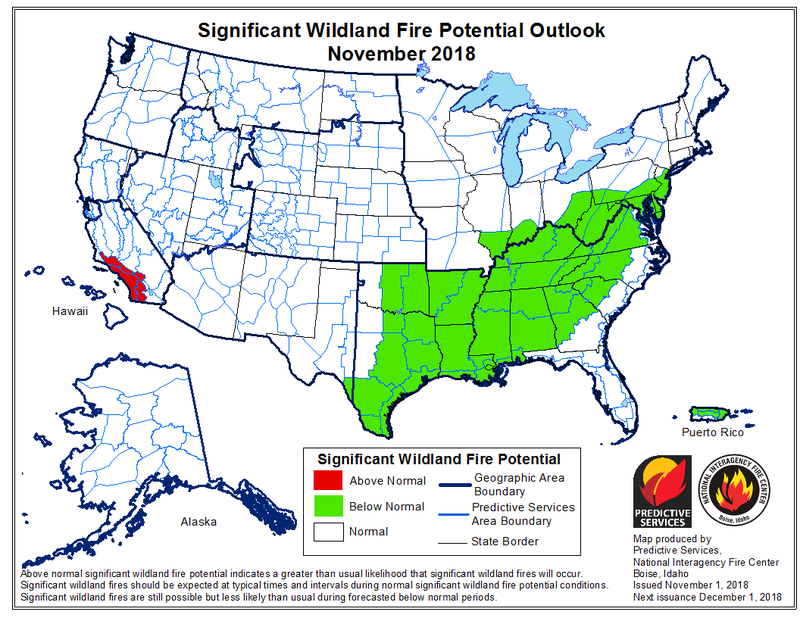 One more data point is the wildfire outlook. We are forecast to receive a lot of rain starting tomorrow, with flash flooding concerns in the recent burn scar areas of the mountains and canyons. They are forecasting rain for about a week from Hurricane Rosa, and then snow following all the rain. Sorry that you are in harm's way of Hurricane Rosa. I would have gladly taken some of that rain off your hands, but it appears just about all of it will miss Northern California. One more data point is the wildfire outlook. These outlooks are to be found here - correct? It is a little late in the dry season to worry about wildfires - I hope! However, I'll try to add these to the climate outlooks for the dry season next year. Correct Edouard. They predict wildfire risk each month for the following three months. This prediction returns to above normal temperatures for the Western parts of the United States. Like last month, only a narrow patch of the Pacific Northwest is expected to have below normal rainfall. The rest of the country is either above or equal chance for any possible outcome. This is consistent with the forecast of last month. Given that the current forecast shows no rain for Northern California through mid-November, my suspicion is that this outlook is more optimistic than the circumstances warrant. 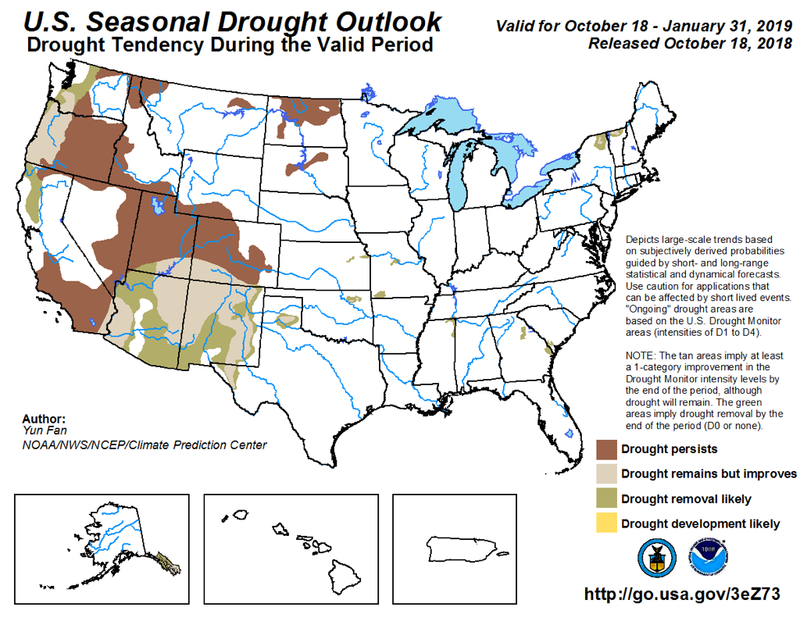 This proposes drought intensifying in the 4-corners region and Oregon. This is a reversal from last month. 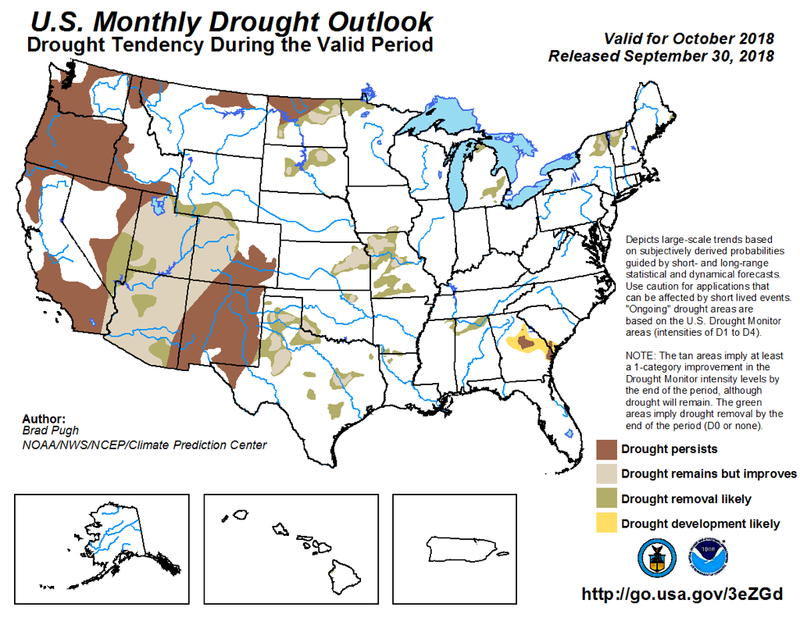 This also reverses from last month proposing some drought relief for Arizona and New Mexico. I always appreciate you posting these. I don't always like what they depict. I don't always like what they depict. Alas, I'll sadly second that motion. Definitely hard times in the United States Western states. . . . This prediction is typical except for "hole" of colder temperatures around Utah. I do hope that Blick's heater has been serviced this year! In the West this is a more "typical" temperature prediction from the Climate Prediction Center. The rest of the country is left in a state of "Equal Chance." This prediction is different and apparently has something to do with El Niño. Nonetheless most of the country is either expected to have above normal precipitation or an equal chance. While not as optimistic, much of the country is once more either above normal or an equal chance. Only the great lakes would get below normal preciptation. 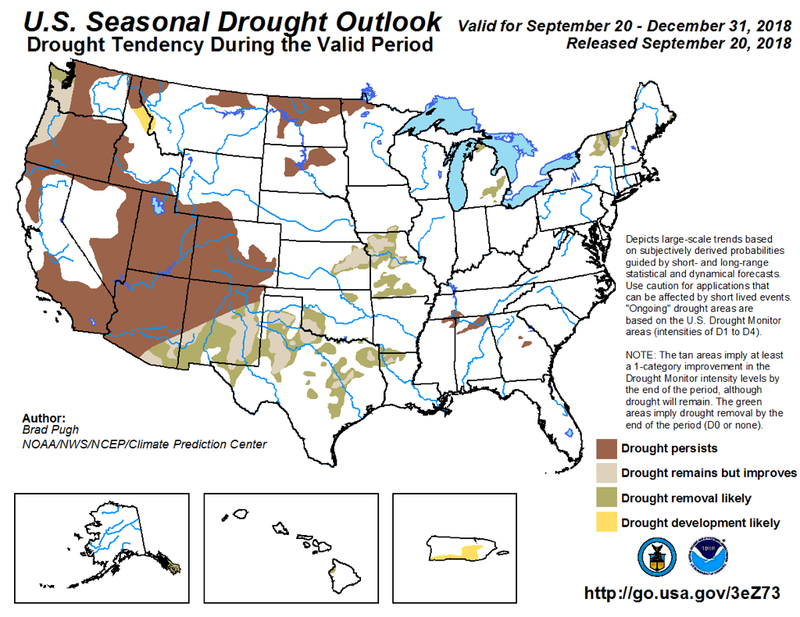 This proposes drought intensifying in Oregon, Utah, and Colorado. That seems a bit odd given the precipitation outlook. Other areas like California are expecting some relief. The only real shift is an expectation of improving conditions for coastal Oregon. We have so far received almost 4 times as much snow here as we did last year in the period Sept - Dec so these above average precipitation forecasts have been accurate. Thankfully.